BERLIN - Mineralogist and materials engineer Dr. Heinrich Ruland announced yesterday that his team was able to create a synthetic Horologium crystal with an increased purity rating by incorporating a Chinese grain alcohol called Baijiu. "I remembered an article from 2008 about some physicists in Mexico that made diamond film from tequila," Ruland said, "I started looking at the chemical properties of different spirits and found that baijiu has some useful constituents." 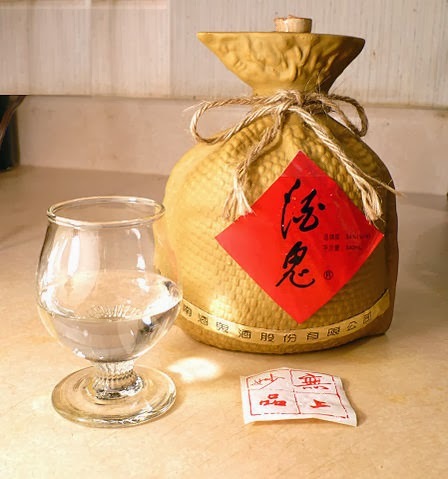 Baijiu is a traditional Chinese neutral grain spirit that is typically distilled from sorghum and other grains, and is one of the most popular spirit categories in Asia. Previously, Ruland's team was only able to achieve a Horologium purity rating of less than %92.06, but with the addition of the Chinese liquor to the process they were able to create a small crystal with a %93.7 rating. The Horologium purity rating is based off of the chemical properties of the original, and perhaps only naturally occurring Horologium specimen used in the Allied WWII era temporal device, Project Time Machine. "I'm not sure if we'll ever be able to create anything as pure as [the original] crystal," Ruland said, "But if we make a more pure crystal, we can generate more stable temporal rifts and our sensor equipment will be more accurate." Ruland's team reported a %2.132 increase in stability with the new crystal in laboratory tests. The team is currently unable to produce large crystals with this new method, but smaller crystals are useful in portable temporal devices, and the team plans to continue working with baijiu to create larger crystals.